Art.com has done it again! 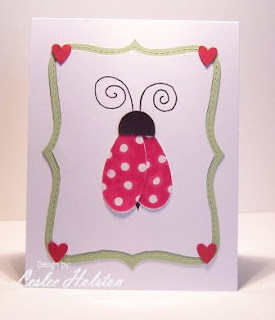 This Lovebug, Ladybug print by Tania Schuppert has inspired today's card. Again, this is for the CAS#23 challenge on SCS. The scroll style frame on the print immediately reminded me of the Big Shot Top Note die. I ran a piece of Certainly Celery and Whisper White card stock through the Big Shot. I trimmed off the edge of the Whisper White and layered it onto the Celery. In the corners, I adhered the small heart from the Heart to Heart punch. The lovebug is simply one of the petals from the Pick-A-Petal set. I stamped it in Real Red ink onto Glossy White card stock, cut them out and adhered them to the back of a 3/4" punched circle of Basic Black with a 1/4 of it snipped off (the head). Placed that in the center of my 'frame' and drew in the antenna and body freehand with a Basic Black marker. It is all layered onto a Whisper White card base. Really easy peasy! And to think, it was inspired by children's art. Clean and simple and under ten minutes! Thanks for stopping in today. I hope you've been inspired to give the CAS challenges a try. There's a new one post every Monday on Splitcoast.